We’ve traveled a lot this year, taking trips to Chicago, Orlando, and all 10 states on our 17-day road trip. One reason we chose to do so is because the kids are older (they’re now 10, 10 and 13), which makes it so much easier. I used to pack for all five of us–making sure that everyone had what was needed for every second of every day. But no more! Now, I expect my tweens to pack for themselves, and I’ve trained them to do so. 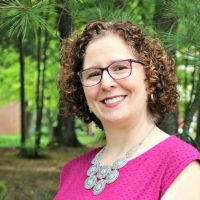 I am so much less stressed leading up to a family vacation–it’s awesome! It’s a new kind of freedom that has allowed me to enjoy our family travel so much more. 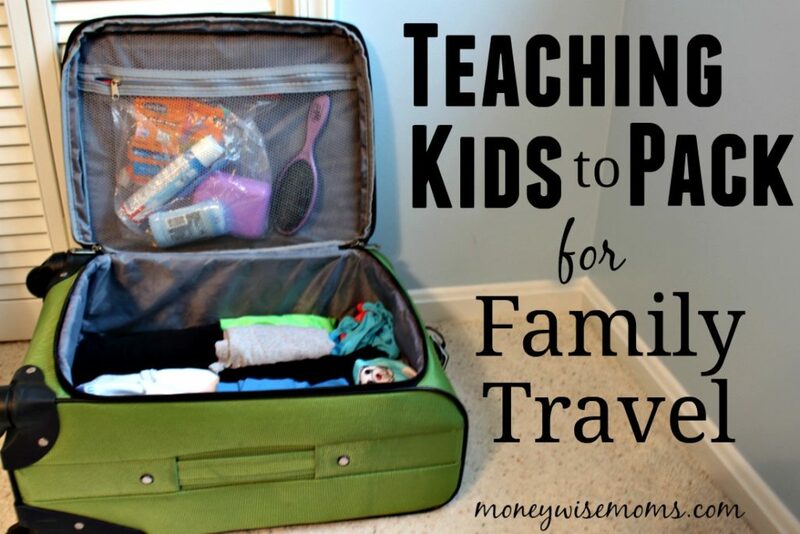 Are you ready to teach your kids how to pack for family travel? Let me show you what is working for us. For the longest time, I’d pack everyone in a couple of suitcases, since the little kids’ clothes were little and I was doing all the packing anyway. Not anymore! To encourage independence, each child got their own suitcase (we picked up inexpensive ones in different colors–no black, so they’re easy to find in baggage claim). Each kid also packs a backpack with their “entertainment” for the road trip or plane ride. To move the responsibility off of me and onto the kids, I made up a printable packing list. It’s a Word document that can be easily edited to the number of days that we are traveling or for the season. It’s divided into clothing, toiletries, and “for car,” which can be changed to “for plane” when needed. Before each trip, I go in and change the number of outfits each kid needs to pack, plus anything special like a swimsuit, etc. You know how hard it is to get kids to fold and put their laundry away (even on a good day). Rolling is so much easier, and it’s the best way to pack a suitcase because you can fit more in and fill each nook & cranny. My kids learned quickly to roll their shirts and shorts to fill in the bottom of the suitcase, then fill in the gaps with their underwear, swimsuit, etc. Pants are easy to roll, but shirts are a little trickier. Just fold the shirt in half, fold the sleeve in, and then roll. We always bring two pairs of shoes–sneakers and slides–and they wear one on the plane and pack the other. Socks can be packed inside shoes to fill in the empty space. Each kid is responsible for their own toiletries, packed in a zipper bag. They use the packing list to be sure they remember everything. Each kid gets a plastic grocery bag to keep in their suitcase, and it’s the designated spot for dirty laundry. On this last road trip, we packed light so I knew I’d need to use a laundromat. I took the all® free clear mighty pacs® and all® Free Clear dryer sheets because all of us have sensitive skin and are allergic to trees, grasses, and pollen. Visiting so many national parks and hiking outdoors, I wanted to be sure we could enjoy the trip, so we washed with all® free clear to help remove 99% of the top everyday and seasonal allergens. Twice during the 17-day trip, I had to do a few loads of laundry, and neither of the laundry rooms had safe laundry detergent for sale, so I was so glad I brought it along! Especially with the single-use all® free clear Mighty Pacs®, make sure you follow the directions for use on the packaging exactly. 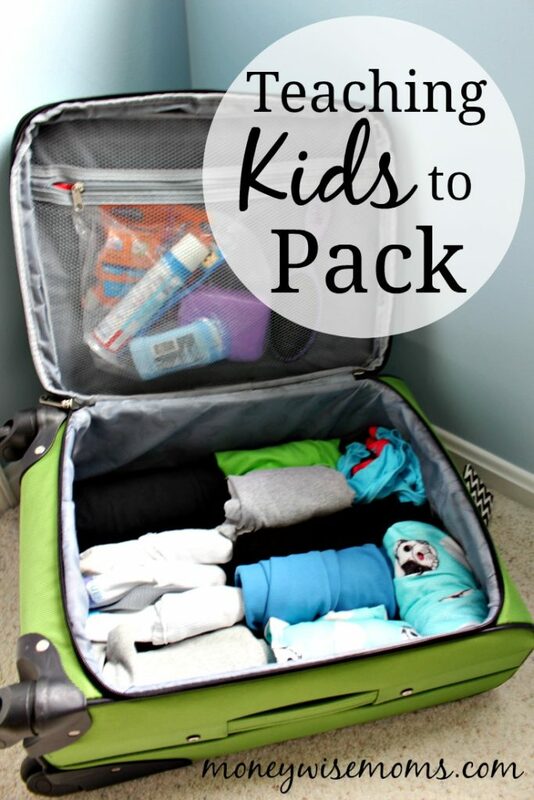 Using these steps, my kids have practiced and succeeded at packing for themselves all year. I love being able to count on it now! Wherever your next trip takes you, encourage your kids to be independent and pack for themselves. It’s an important skill that they’ll need when they’re older, and by doing it now, it frees up your time and stress to enjoy your family vacation even more. I have exclusively used all® free clear detergent since 2003 when my first child had excema because of his allergies. Did you know it’s the #1 detergent for sensitive skin recommended by Dermatologists, Allergists, and Pediatricians? I love finding it on sale and using the coupons they provide monthly in the Sunday newspaper inserts. This time around, I picked it up at Target (easy to find in the laundry aisle). Head over to the all® free clear Back to School website where you can download a coupon! My kids are 7, 5, and 2 and still very much rely on me to make sure that I pack everything they need for a trip. I can’t wait until they can pack themselves! I don’t even know what it will feel like to go from packing for 4 to packing for 1 (me)! My girls pack their own bags but having a list ready for them is a great idea. That way I know they have everything they are going to need. Having everyone pack for themselves is a wonderful idea. It would save me so much time. I never thought about bringing my own laundry detergent on road trips before. I love these packing tips!! It is so much fun to travel as a family, but packing is always insane with three kids. I love your tips. We have done some travel along with the kids and they have slowly learned how to pack for themselves. Girl Scouts taught me about rolling my clothes for packing! Definitely some knowledge that I would hand down to my kids as well. A packing list is a great idea. I need to learn how to pack better. I always have way to much. 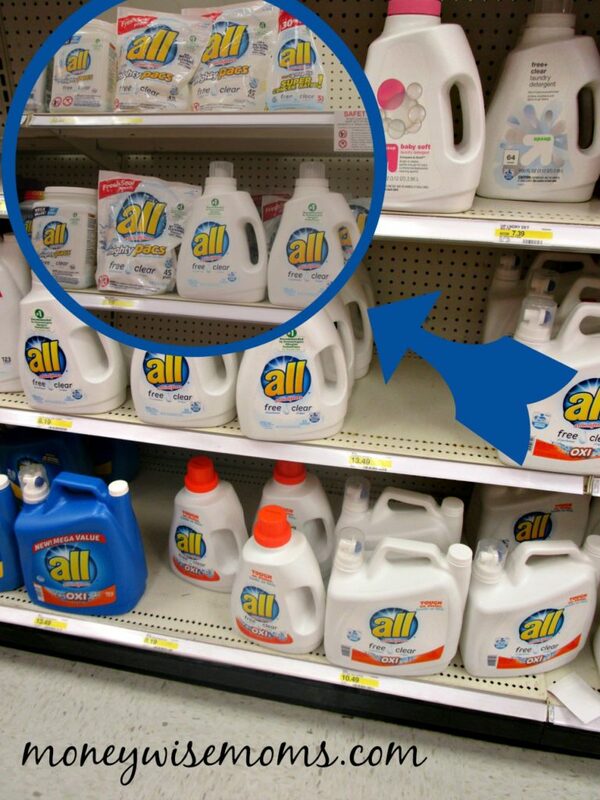 We use all® free clear detergent in our house. It always get the clothes nice and clean with no stains. These are great tips for packing. It is a great idea to limit bags to one per person. I will have to make a packing list next time we go on a trip. Now that the kids are older we let them pack their own bag. I make a list of the essentials for them. Rolling clothes is always a good strategy. My daughter and I tend to overpack so it’s good to have ways to fit in all of the outfits. HA! I shove all the littles clothes into one suitcase, because they are tiny. I need to give the older ones more independence though. We love those all mighty pacs for travel! 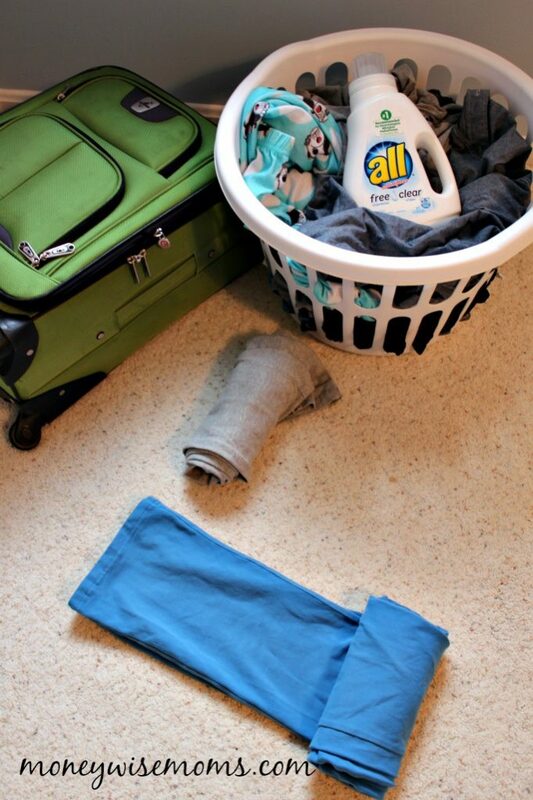 I love the idea of rolling up the clothes to pack more into a suitcase. Now that my son is older he can pack his own bags so travel has been much more simple. Getting kids to help makes packing so much easier. We used all free clear military version for YEARS when hubby was in the army. These are all great tips for teaching kids how to pack. I will have to use these tips with my daughter who is 6. I think it is a great time to start teaching her how to pack her own bag. Wish I’d read this a decade ago. I now have teenage girls and they are terrible packers. Makes it hard to be mobile when we go to Europe haha.